Here in the U.S., it’s easy to forget that some of our fellow Apple fans around the world don’t have access to the resources we take for granted. So we’d like to extend a warm and hearty welcome to users of Apple products in Latin America, who as of Tuesday now have access to the iTunes Store and, in Brazil, iTunes Match. In Brazil, the store launched with more than 20 million songs, including local artists such as Ivete Sangalo and Marisa Monte, along with music from all the major labels and many independent labels as well. Grammy-winner Roberto Carlos’s catalog is even making its digital debut on the Brazilian store. Most albums will be priced at the equivalent of $9.99, with most songs—encoded, naturally, as iTunes Plus 256-kbps DRM-free tracks—at the 99-cent mark. Music isn’t alone on the Brazilian store, either; the country also gets access to movies from the major studios for rental or purchase—including titles in HD. In addition, the iTunes Store (sans movies) will arrive in 15 other Latin America countries: Argentina, Bolivia, Chile, Colombia, Costa Rica, Dominican Republic, Ecuador, El Salvador, Guatemala, Honduras, Nicaragua, Panama, Paraguay, Peru, and Venezuela. But perhaps the most significant part of the announcement is the release of iTunes Match in Brazil. Apple launched its cloud music service in the U.S. in mid-November, and while the company has said it’s working to roll out the feature around the world by the fast-approaching end of the year, Brazil is the first country to reap the benefits. As in the U.S., the Brazilian iTunes Match will cost $25 per year, and allow you complete, cloud-based access to all of your music on all of your Apple devices. Given that Apple products usually first appear in countries like the UK, Canada, Australia, and Japan, it’s surprising that Brazil is the first non-U.S. country to get iTunes Match. 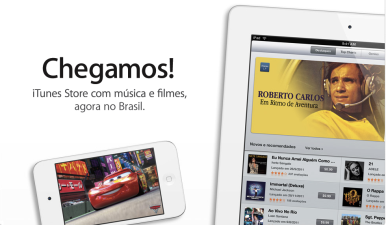 But it seems likely that Apple wanted to sweeten the pot for the introduction of the iTunes Store in Brazil. It’s a big market, and given that it’s taken eight years for the iTunes Store to reach the country, customers there deserve a little something extra. Still, as the end of the year approaches, it seems likely that we’ll see iTunes Match quickly expanding to other countries before 2011 is up—though it’s always possible that Apple could miss its self-imposed deadline.